Boasting around 80 species, Oklahoma ranks third in the U.S. for reptiles. Among the most interesting reptiles to be found in Oklahoma are its state reptile -- the collared lizard -- as well as the fence lizard, the six-lined racerunner, the earless lizard, the round-tailed horned lizard and the unusually built glass lizard. The collared lizard is an omnivorous but very territorial lizard, roughly a foot in length, with a band or collar of dark, usually black, color around its neck. The rest of its skin is often a bluish-green, but it can also be found with light brown coloring. When threatened, it stands as high as it can and stretches its throat to appear larger. 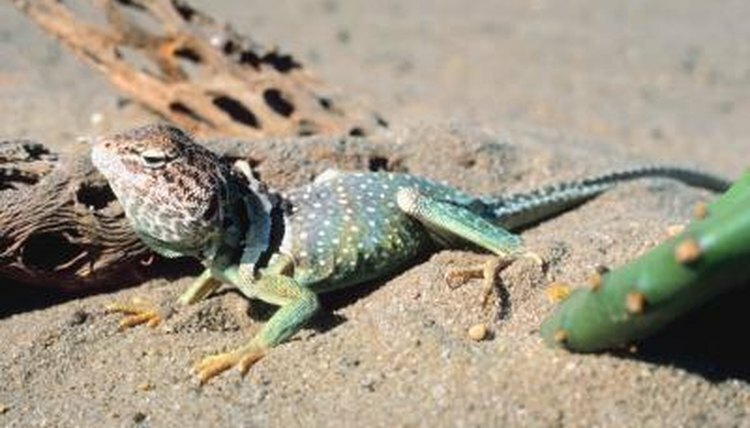 One of the collared lizard's most noteworthy behaviors is that it often runs on its hind legs, achieving speeds of around 16 miles per hour. Fence lizards are small lizards, between 4 and 7.25 inches, that are cryptically colored, meaning they have evolved to feature coloring that helps them blend into their environment. These colors are somewhat muted grays, blacks or browns to match the dry forest landscapes in which they are comfortable. The exception to this coloration is that males, during mating season, develop noticeable blue patches under their chins and bodies. Fond of the heat, the six-lined racerunner can be seen even on the hottest days of an Oklahoma summer. The racerunner is a streamlined lizard with almost black skin and six yellow or white stripes that run horizontally from its nose all the way to its tail. They range from 6 to 9.5 inches, making them small enough to hold, but they are also extremely fast and difficult to catch. The easiest way to identify an earless lizard is to check for the ear holes that most lizards have on the sides of their heads. If it doesn't have them, it is almost certainly an earless lizard. Earless lizards are also fairly small lizards, less than 3 inches in length. Like the fence lizard, they are cryptically colored, with their colors usually matching that of the soil in the environment where they are found. The round-tailed horned lizard is another small lizard, also under 3 inches long, with a chubby body that closely resembles a rock. It is easily identified by its short tail and, most notably, the crown of short, spiky scales that project from the back of its head. Its underside is usually unmarked white or yellow, but the coloring of its top is usually a mixture of local colors and grays, tans, or browns, and can change color to more closely match the soil of its surroundings. The first thing you will notice when examining a glass lizard is that it does not look like a lizard. At 18 to 43 inches, and with no legs, the glass lizard much more closely resembles a snake. And you thought the earless lizard had it rough. They can be distinguished from snakes, in one way, by comparing their heads. Unlike a snake, the glass lizard's jaws will not unhinge and, like other lizards, they have ear holes on the sides of their heads. They are called glass lizards because they will break the end of their tail off to escape danger, and can do so in several places. The pieces grow back, in time, but it is still a bad idea to try grabbing one by its tail.